Nexthink can add a lot of value to a wide range of ITSM processes to support the strategy, design and transformation of IT Services; we will explore these aspects in future articles. For now, we’ll focus on how Nexthink can not only speed up the process of resolving incidents, but also prevent many from being opened at all. Typically, Incident Management is a structured, multi-stage process intended to record the details of the incident and then use this information to correctly classify it and, if it cannot be resolved immediately, assign it to the appropriate group for deeper investigation. In an ideal world, this should lead to the resolution of the incident and communication back to the affected users. Also, in the same ideal world, enough information should have been captured to support related disciplines such as SLA reporting and planning for future improvements to the affected service. Unfortunately – as IT’s view of the world is largely limited to the datacenter – effective incident management is hampered at every stage by the lack of both accuracy and completeness of the data that is available about both the user’s device and its connectivity to IT Services and the experience of the end user themself. By following the reactive-oriented ITSM status-quo, organizations will continue to be impacted by two factors; the unnecessary creation of incidents that impact on the user’s ability to do their job and the need to spend far too much time and resource to resolve them. Together, these contribute to significant costs and productivity issues as ITSM is consistently busy solving resource-intensive incidents. For that reason, the core elements of a proactive ITSM approach is to reduce MTTR and increase MTBF – both areas where Nexthink can provide unique and significant value. Nexthink provides the ability to not only resolve incidents efficiently, but also to prevent their escalation to higher levels. Nexthink gives level 1 support the ability to solve far more incidents instead of escalating them to more scarce and expensive level 2, or significantly more costly level 3. This is done by providing both the comprehensive tools to act upon current incidents (reduce MTTR), as well as the ability to detect and solve issues before they even manifest themselves (increase MTBF). This results in a positive outcome as end users can now experience a new level of digital satisfaction, and the IT organisation has newly-found breathing room to innovate. Essentially, costs are taken out of the system and replaced with quality. But it doesn’t stop there – without visibility of the users of IT services and the performance, behavior and compliance of their devices, IT is blind to the large majority of digital workplace issues. 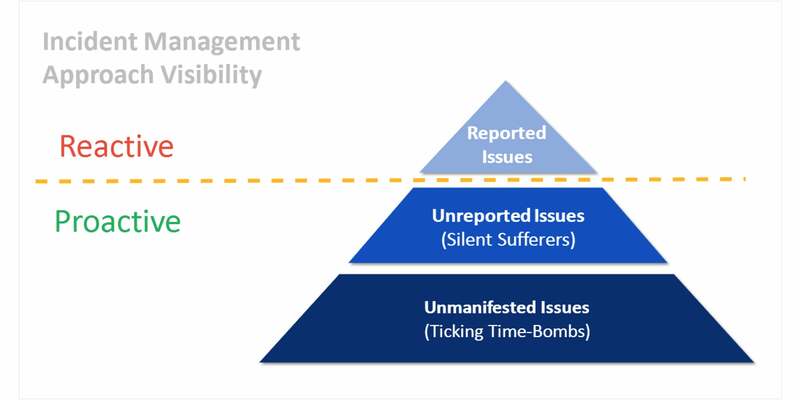 Indeed, for every end user who bothered to report an incident, there are many more with the same problem who suffer in silence due to the hassle of reporting to IT. And for every one of these sufferers, there is an immeasurable amount of future “ticking time-bomb” issues that have not yet manifested themselves. For that reason, Nexthink’s approach to proactivity intrinsically relies on user engagement and comprehensive, real-time monitoring of their devices to shed light on that huge chunk of affected services underneath the radar – both current “sufferers-in-silence” and incoming “time-bomb” issues. 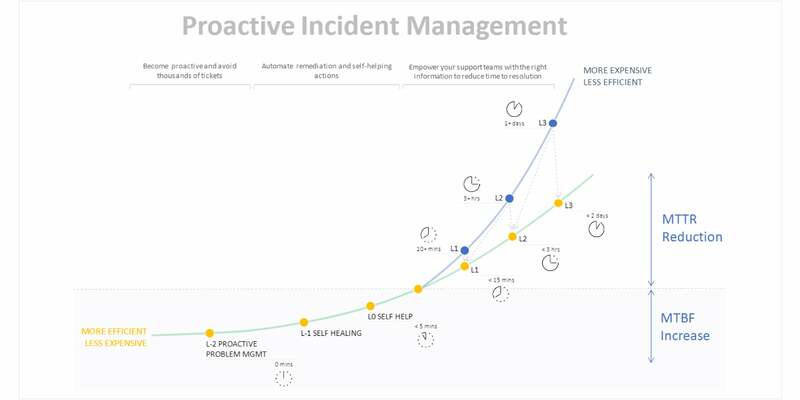 In summary, while reactive incident management is useful to solve higher-level visible issues monitored from the datacenter, the proactive approach goes deeper by dealing with the hidden and yet-to-come issues from a combination of both technical and experience-based user data. Essentially, for every reactively-solved issue, there is an exponential amount of proactive resolution potential. In addition, having the right tools and data at your disposal to deescalate current incidents enables cost, time and productivity to be optimized. In that light, it is evident that the traditional ITSM approach to incident management is not wrong – it is simply based on outdated processes. Modern tools, such as Nexthink, are disruptively modernizing ITSM by shifting from reactivity to proactivity.